A few weeks ago, I had company coming for dinner and since it was a week night, I knew I wouldn’t have a lot of time to put together something fantastic when I got home from work. Dragging my slow cooker out of the cupboard and rinsing off the cobwebs, I decided a nice, hearty soup would do nicely. 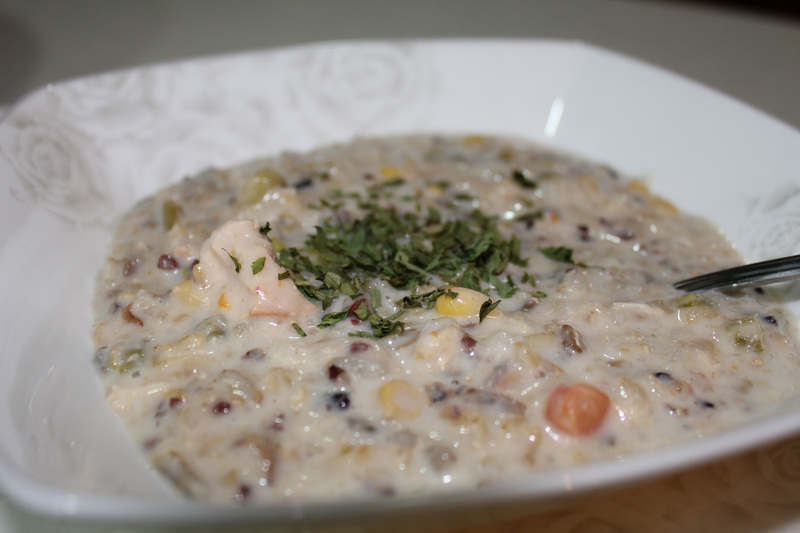 At the time, the temperatures were ridiculous frigid, so the idea of a steaming bowl of creamy deliciousness sounded really yummy. This soup is so good, comes together quickly, and can be left simmering in your slow cooker all day, ready to razzle-dazzle your guests (or family) when you get home from work. 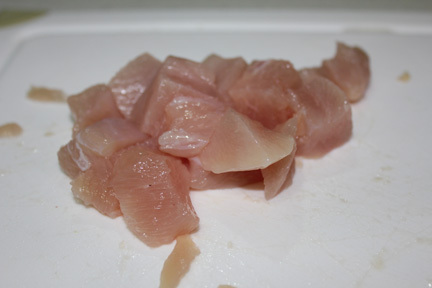 Cut boneless, skinless chicken breast into bite-sized pieces. 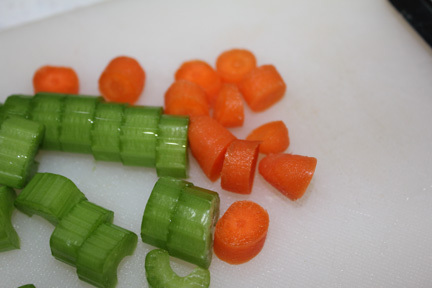 Chop celery and carrots into about 1/4 inch thick pieces. 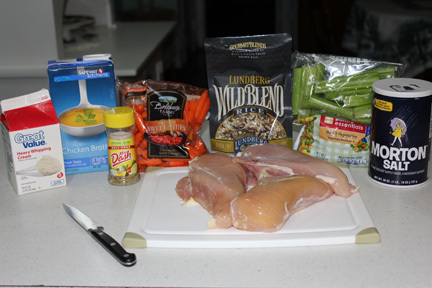 Place chicken in the slow cooker and season. Add rice and frozen veggies. Pour in broth, cover and set to cook for eight hours. (If you’ll be home sooner, set it for six, later, set it for 10 on low). 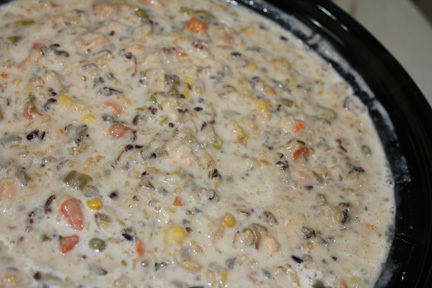 About 10 minutes before you are ready to serve, pour in a cup of heavy cream, and stir to blend it into the soup. By this time, your mouth should be watering and you can’t hardly wait to scoop up a bowl and devour. To serve, add a little parsley garnish, a sprinkling of grated cheese or some toasted bread crumbs. 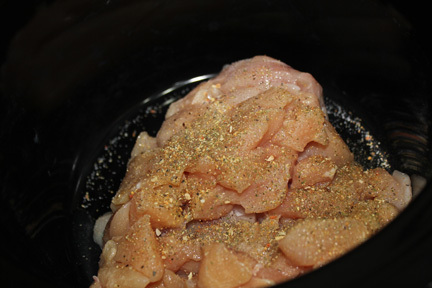 Spray the inside of your slow cooker with a non-stick cooking spray. I used a 5.5 quart Crock Pot, so if yours is smaller, just reduce the amount on the ingredients accordingly. 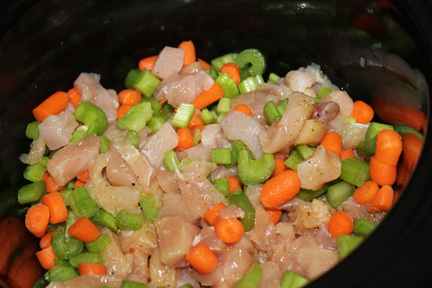 Cut chicken into bite-sized pieces and add to the slow cooker. Sprinkle with salt and seasoning (I used about 1 tsp. salt and 1 tbsp. seasoning). Chop celery and carrots into pieces about 1/4 inch thick. Add to chicken. Add frozen veggies and the rice. 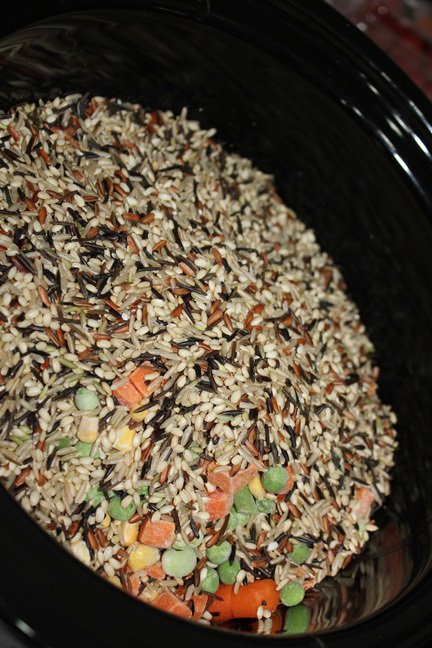 (I used a blend of long grain brown, sweet brown, black and wild rice). 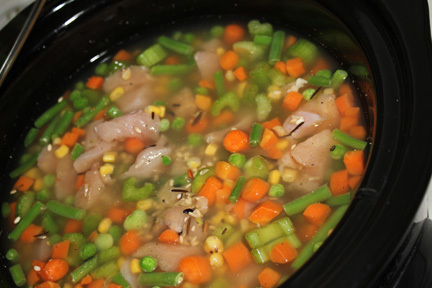 Pour the chicken stock in, cover and set your Crock Pot to cook on low for eight hours. (Mine ended up cooking 10 by the time I got home, which was just a tad longer than it should have gone). 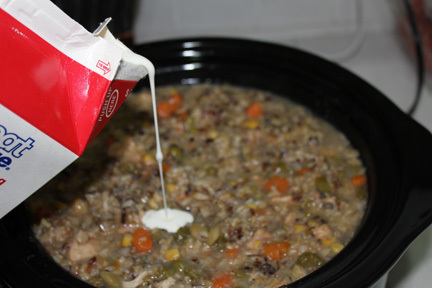 About 10 minutes before you are ready to serve, add 1 cup of heavy cream to the soup and stir thoroughly to mix. Serve with a garnish of parsley, shredded cheese, or toasted bread crumbs. Perfect for a cold wintery day!